Identifying geographic areas with significantly high risks of stroke is important for informing public health prevention and control efforts. 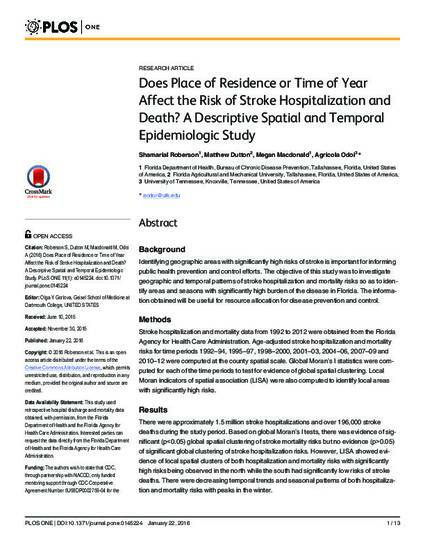 The objective of this study was to investigate geographic and temporal patterns of stroke hospitalization and mortality risks so as to identify areas and seasons with significantly high burden of the disease in Florida. The information obtained will be useful for resource allocation for disease prevention and control. Stroke hospitalization and mortality data from 1992 to 2012 were obtained from the Florida Agency for Health Care Administration. Age-adjusted stroke hospitalization and mortality risks for time periods 1992–94, 1995–97, 1998–2000, 2001–03, 2004–06, 2007–09 and 2010–12 were computed at the county spatial scale. Global Moran’s I statistics were computed for each of the time periods to test for evidence of global spatial clustering. Local Moran indicators of spatial association (LISA) were also computed to identify local areas with significantly high risks. There were approximately 1.5 million stroke hospitalizations and over 196,000 stroke deaths during the study period. Based on global Moran’s I tests, there was evidence of significant (p<0.05) global spatial clustering of stroke mortality risks but no evidence (p>0.05) of significant global clustering of stroke hospitalization risks. However, LISA showed evidence of local spatial clusters of both hospitalization and mortality risks with significantly high risks being observed in the north while the south had significantly low risks of stroke deaths. There were decreasing temporal trends and seasonal patterns of both hospitalization and mortality risks with peaks in the winter. Although stroke hospitalization and mortality risks have declined in the past two decades, disparities continue to exist across Florida and it is evident from the results of this study that north Florida may, in fact, be part of the stroke belt despite not being in any of the traditional stroke belt states. These findings are useful for guiding public health efforts to reduce/eliminate inequities in stroke outcomes and inform policy decisions. There is need to continually identify populations with significantly high risks of stroke to better guide the targeting of limited resources to the highest risk populations.